The Tanglewood is an outdoor floor lamp that may be used as general lighting for entertaining or task lighting for reading, crafting, and more. 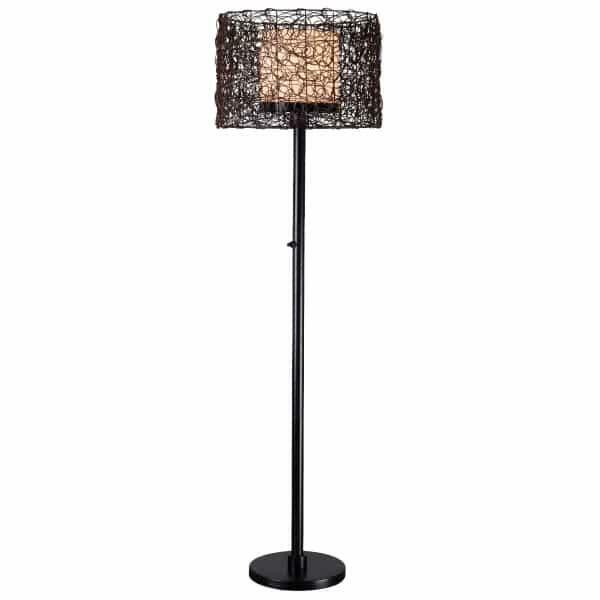 The Tanglewood Floor Lamp features a white glass inner shade covered by entwined rattan. Rattan has the look and feel of wicker, and coupled with the bronze finish of the lamp base, may match perfectly with outdoor wicker sets or upscale settings. The Tanglewood is equipped with the safety features that enable outdoor placement, like UL listing for outdoor locations that may be wet, completely rustproof materials, UL waterproof switch for turning the light on and off, and a heavy base for stability during high winds or storms. UL is a safety laboratory that tests products for their safety, and Tanglewood has passed the test on multiple accounts, thereby carrying the UL approval marking. If the Tanglewood’s controlled chaos patterning suits the style of your outdoor space, freely place your trust in the Kenroy Home construction and care.